Air out cobwebs and shed December pounds at these Western Washington water sites. It’s the start of a new year — also known as the time when we emerge from two months of eating, drinking and huddling for warmth during the holiday season. If you’re like me, your backside is growing and your muscles are shrinking. In other words, it’s time to get up and move. But it’s January, which presents a problem: Cold plus inertia means even a neighborhood walk seems like a big ask. In the Seattle area, we have one weapon that people in, say, Wichita don’t: beaches. Lots of them. Beaches are invigorating and life-restoring: Something about waves, water and long vistas puts us in a meditative state and makes us feel connected to nature. Maybe there’s something to the idea that all those water-generated negative ions boost our mood and creativity. Beaches are almost always snow free, and no trees or buildings block the sun — when it’s out. Besides, even with our shoes on, sand and pebbles are more of a fun challenge for our feet than the same old sidewalks. To get you started, here are nine of my favorite beach walks. • West Seattle beaches: They’re bustling in the summer but surprisingly serene in winter, and Seattle skylines are visible even on a cloudy day. A water taxi runs year round (though not on weekends or holidays in winter) from downtown to Seacrest Park. That’s one of a few connected parks hugging the peninsula’s edge, featuring miles of beach and paved paths. 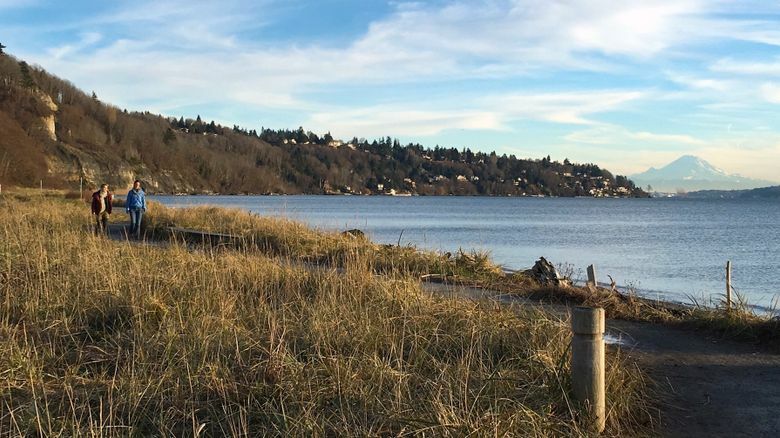 My favorite West Seattle waterfront isn’t part of that string: at west-facing Lincoln Park, the beach feels private and secluded, and the short walk through trees to get there makes for a protected leg stretcher even on blustery days. seattle.gov/parks/find/parks/lincoln-park. • Discovery Park, Seattle: You can’t really talk about beaches near Seattle without mentioning the city’s largest park, at the Magnolia neighborhood’s northwestern tip. A lack of parking near the beach and steep, sometimes slick access paths reduce crowds but can make this a tough sell for young kids. Note that dogs are banned from beaches in Seattle parks.seattle.gov/parks/find/parks/discovery-park. • Juanita Beach Park, Kirkland: This park’s best assets lie beyond the beach; it’s hard to find this variety of landscapes in such a small area. A long pier stretches over the water, and a nearby wetland is great for bird watching. And while it’s often packed in summer, in winter you might have it to yourself — except for the wildlife. st.news/2i4e1dl. • Gene Coulon Memorial Beach Park, Renton: On the south end of Lake Washington in Renton, it’s more developed than Juanita Beach Park (it has an Ivar’s!) but feels a bit similar, with paved trails, a sandy beach and a fishing pier. Dogs are not allowed. st.news/2i4l45W. • Marina Beach Park, Edmonds: Not huge but easily accessible, the park is near the marina, other small beach parks, and the shops and restaurants of downtown Edmonds. Let your pooch run free on the sand at the nice off-leash area on the south end, complete with an agility course and a separate area for small dogs. st.news/2gZSMM4. • Camano Island State Park, Camano Island: Go beyond a walk on the beach and rent one of the cabins tucked into the 173-acre park’s forested upper section, which also includes wooded trails for a break from sea breezes. Spend a weekend walking up and down more than a mile of rocky beach at the state park as well as exploring Camano’s other beaches and rural vibe. parks.state.wa.us/484/Camano-Island. • Double Bluff Beach, Whidbey Island: Kids can search for detritus among strewn logs on this wide expanse of sand beneath imposing bluffs on Whidbey Island’s south end, and pooches will love the all-out frolicking the spacious dog-friendly section affords. Combine Double Bluff with a jaunt north to climb on old battlements at Fort Casey and explore even more beaches at Ebey’s Landing, and you will have earned a hearty lunch at one of Whidbey’s cozy eateries. st.news/2hOFJf1. 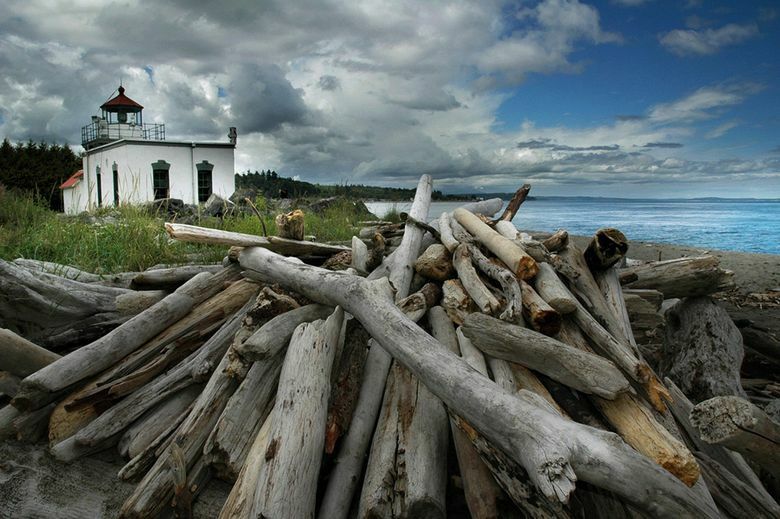 • Point No Point County Park, Kitsap Peninsula: Although tours of the cute little lighthouse here (the first built in the Puget Sound area, it began operating in 1880) are only offered April-September, you don’t need to see inside it to fully appreciate its surroundings. Set on the flat northeastern tip of the Kitsap Peninsula, this beachfront offers 270-degree views of Whidbey Island and the mainland. st.news/2hOvqYa. • Salt Creek Recreation Area, Olympic Peninsula: You don’t have to go all the way to the Olympic Peninsula’s west side to get a taste of cliffs, islands, and rocky outcroppings. While Olympic National Park gets most of the attention, discovering this county park 15 miles west of Port Angeles feels like stumbling onto a lovely secret. Kids love climbing on rocks and investigating tide pools at Tongue Point Marine Sanctuary. clallam.net/Parks/SaltCreek.html. • Bundle up. Even if it feels warm at home or the sun is shining, cold beach breezes steal heat. Bring a hat or earmuffs, gloves and warm, waterproof footwear. • Be aware of tides. High tides tend to be higher in winter, which can shorten your walk when parts of the beach become impassable — and the last thing you want in the middle of winter is to be stranded by high water. • Know the rules. Research in advance whether a beach is dog-friendly. While many dog owners disregard rules, scofflaws can be fined. Carting away driftwood or other souvenirs is often prohibited, and shellfish collecting is legal only at certain times and requires a state-issued license. State parks require a Discover Pass, $10 daily or $30 annually. Christy Karras is a Seattle-based freelance writer.